“Pete the Monkey is a cult figure of the ape world. He first shot to fame when a YouTube video of him washing the dishes became an international web sensation. 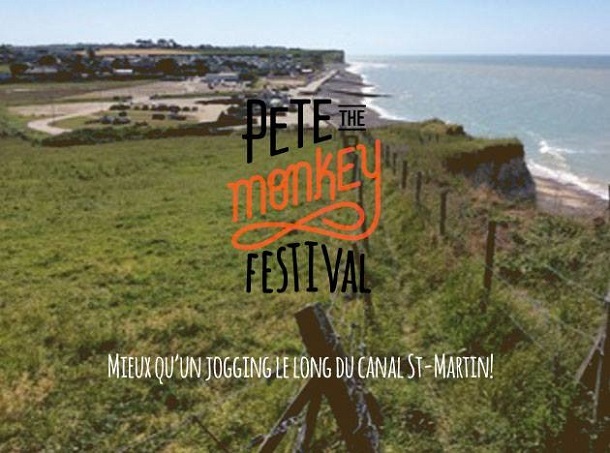 “The home of Pete the Monkey Festival is the picturesque seaside village of Saint-Aubin-sur-mer, in rural Normandy. It’s the perfect place to get back to nature and rediscover your inner gorilla. Lost Horizon at Pete the Monkey 2016! Be free… Unwind and rejuvenate away from the bustle and mayhem. Melt in a hammock, recharge in the sunshine or lounge by the fire in the warm and cosy sun lodge. The luxurious wood-fired yurt sauna will be sizzling every day from 8am – 2am. No need to book – Available at our reception, a Lost Horizon wristband allows you entry throughout the weekend. “Pete was living at a monkey sanctuary in El Chapar, Bolivia, after being rescued from captivity. He was not the prettiest monkey and was not very popular with the ladies, so he usually just ended up doing the babysitting. “One day Pete was intently watching Louis as he washed the dishes in the stream. Suddenly, Pete came over and took over the job, scrubbing and rinsing the dishes himself, with Baby Pea (who he was babysitting at the time) still clinging to his back! “Pete the Monkey takes place over three days in July and is situated in rural Saint-Aubin-sur-Mer in upper Normandy.